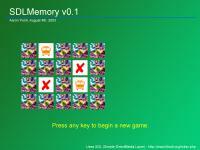 Description: SDLMemory, a simple memory game. Here's my first modes contribution to OS4Depot. The simplest game I could find on libsdl.org.